Victory has a hundred fathers but defeat is an orphan. The farewell between Hitler and Mussolini at the station was very affectionate. Both men were moved. The German decision to fight is implacable. Even if they were given more than they ask, they would attack just the same, because they are possessed by the demon of destruction. 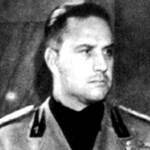 Gian Galeazzo Ciano was Foreign Minister of Fascist Italy from 1936 until 1943 and Benito Mussolini's son-in-law. On January 11, 1944 Count Ciano was shot by firing squad at the behest of his father-in-law, Mussolini, under pressure from Nazi Germany. Ciano left a massive diary, that has been used among others by William Shirer in his monumental The Rise and Fall of the Third Reich and in the 4-hour HBO docu-drama Mussolini and I.